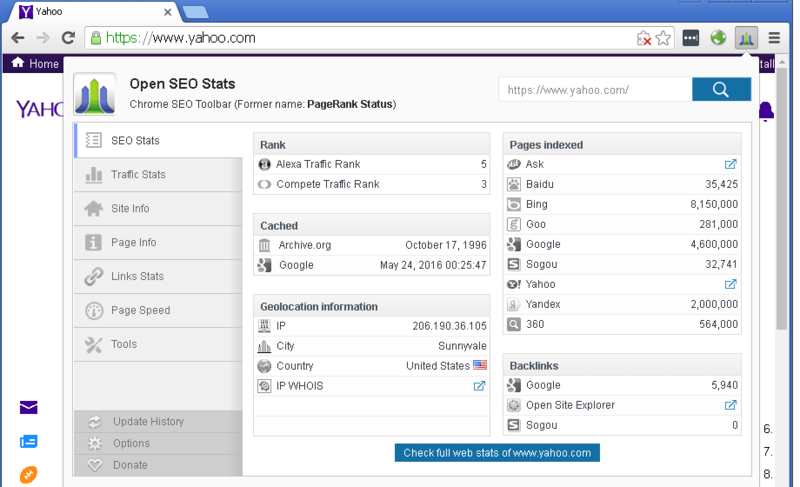 Updated on Sep 16, 2014: PageRank Status has been renamed to Open SEO Stats because of Google Single Purpose issue. Una extensió de Google Chrome per a facilitar l'accés per a veure el rànquing d'Alexa, el rànquing de la competència i el rànquing de Quantcast de la pàgina actual, a més a més, obtenim informació dels backlinks, pàgines indexades, pàgines en caché, xarxes socials, Whois, geolocalització IP i més. Adjust the page layout for Chrome v57.0. Remove Compete and Quantcast from SEO Stats and Trafic Stats page. Compete has been been shut down; Quantcast has been been stopped their public API. Support for Goo.ne.jp and yandex.com new search results of pages indexed. These 2 search engines changed the formats of search results recently. Remove Delicious Likes from Site Info page. Delicious has stopped their publich API to query the Delicious Likes. Notice: All Google icons and names are trademarks of Google Inc. All referenced brands, product names, service names and trademarks are property of their respective owner(s). Copyright © ChromeFans.org, Tots els drets reservats.